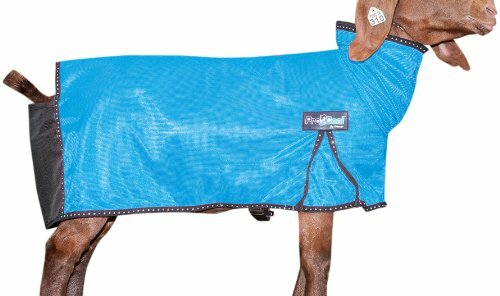 The popular ProCool blanket design is now available in goat sizes with a rear tail cutout. Reflective piping featuring the ProCool name accents the edges for added visibility. Constructed from breathable mesh material that provides excellent ventilation and blocks 98% of UVA/UVB rays, these blankets provide protection from the elements as well as a barrier against fungus. Leg gussets allow for extended leg movement during exercise while the snap and ring ends of the adjustable belly strap rest inside pockets to help prevent rubbing and chafing. Medium size fits goats 40-60 lbs.